The United Arab Emirates (UAE) currently has 9 sites designated as Wetlands of International Importance, with a surface area of 39,080 hectares. Wetlands are among the most diverse and productive ecosystems, indispensable for the countless benefits or “ecosystem services” that they provide humanity, ranging from freshwater supply, food and biodiversity, to flood control, groundwater recharge and climate change mitigation (source: Ramsar Convention). 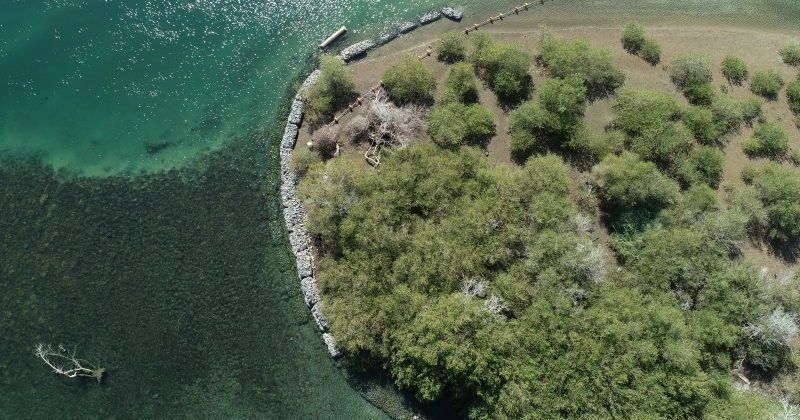 We recently carried out protected area works in one of these wetland areas in the UAE, to stop the erosion process of the mangroves and rehabilitate the area. The erosion protection structure was designed and constructed using gabions, mainly because of their modularity and resistance to strong wave movements. Gabions also have advantages over more rigid structures, such as rock and concrete, because they can conform to ground movement, dissipate energy from flowing water, and drain freely. We also installed an artificial floating island, in order to attract and provide a safe haven for flora and fauna. The first prototype is made of an environmentally-friendly geosynthetic platform. By installing a floating island, a new habitat is created that can be utilized by a wide range of species, both above and below the waterline. Site visits will be conducted on a monthly basis in the coming quarter, to monitor the project. Ecocoast is the global leader in pioneering solutions for sustainable coastal and marine development, and is at the forefront of designing, manufacturing and distributing globally a range of marine protection and demarcation products under the brand Ecobarrier. If you would like to know more about erosion protection, floating habitats or our other solutions, you can drop us a message here.